Hotel 26 opened in 2003 and is located in the middle of the young trendy district of Friedrichshain, in the heart of Berlin. 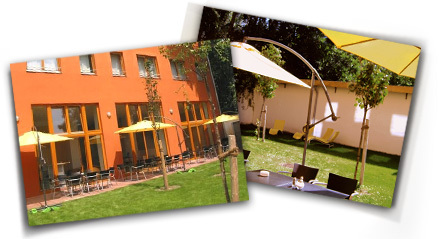 Find out about our friendly and modern choice of accommodation, our Mediterranean Café 26 with its diverse range of food and drink and all about the hip district of Friedrichshain. Of course you can book your room for your next stay in Berlin online, or use the contact form if you have any questions regarding our offers or would like more information. We look forward to hearing from you and welcoming you as our guest! Hier steht Ihnen unser Konferenzraum mit bis zu 25 Teilnehmern bereit. Nutzen Sie bequem unser Tiefgarage.